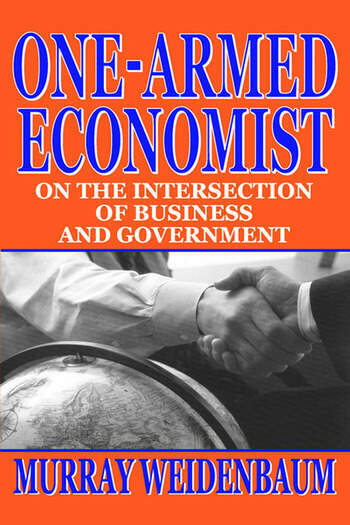 One-Armed Economist represents a personal, if eclectic, approach to public policy. Weidenbaum avoids doctrinaire positions, be they Keynesian or monetarist or supply side or libertarian. This distillation of Weidenbaum's wide range of writings on public policy issues over the last four decades draws on his practical experience in government and business as well as his academic research over that extended period. The volume covers six major clusters of policy issues: economic policy, government programs, business decision-making, government regulation, the defense sector, and the international economy. There are chapters on how to achieve a cleaner environment, how to fundamentally overhaul the tax and health care systems, and a defense of Reaganomics. The work examines how public sector activities impact the performance of the national economy. Its coverage includes the role of government as a buyer, a seller, a provider of credit, and a source of subsidy and support. Drawing heavily on his experience as economist for a major military contractor, Weidenbaum shows that the defense industry is the most heavily regulated sector of the American economy and discusses ways to modernize the arcane and wasteful process of procuring weapon systems. He also draws on his work on the hidden costs of regulation on the consumer, showing how to improve the regulatory process so as to achieve national objectives while minimizing the burdens of compliance. The last section is devoted to the international economy, with chapters on the role of the overseas enterprises. One-Armed Economist is a lucid analysis of major public policy issues of our time. As such it will be of special interest to organizations involved in public policy, think tanks, and government policymaking groups, as well as readers interested in fresh perspectives on a broad range of policy issues.